Besides running this online portal, we believe that by sharing our expertise and talents, anyone can make a difference and contribute back to the society. We believe that the things we share with the beneficiaries, we will like to see them to pay it forward and make a difference in the lives of others as well. Post by The Shop City. 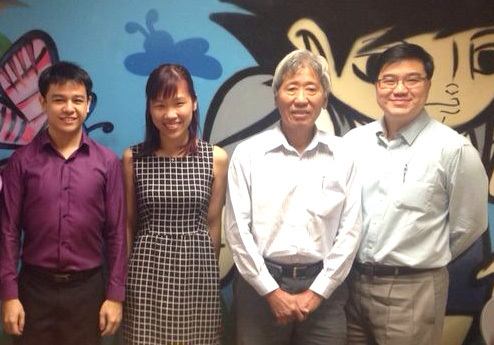 A joint collaboration between Singapore Anti-Narcotics Association Singapore (SANA) and The Shop City, we embarked on a 12 weeks pilot project with 2 shortlisted clients. While we first started off with an idea of equipping them with the handicraft and business management skills, just after 3 weeks, we realized it was more than what we envisioned. We are helping the 2 clients to gain the confidence and the courage to step into something they had never done before. It was such an amazing 12 weeks journey with our beneficiaries! They had grown and witnessed the fruits of their labour! On their graduation day 17th January 2014, family members and friends joined and rejoice with them as they set up a mini booth to showcase and sell their handmade items. Both clients even received advance orders! The first success that came along brought the very much-needed boost to continue to press on. After all the new chapter had only just begun for them. There are many people we want to say a BIG Thank You! For allowing us to work with your clients! Without your support, we would not be able to embark on this project! Thank you for the faith you had in us! Your commitment and motivation to work hard despite the challenges you face in life! 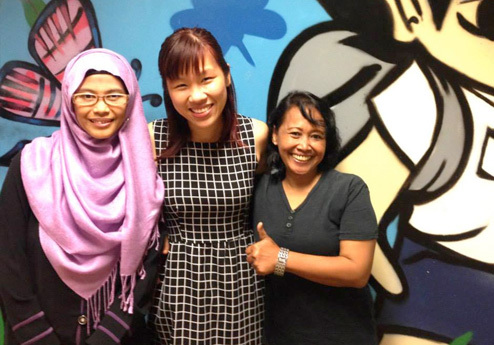 Mdm Lily Yap (middle) from CraftLily taught the clients the skill of Napkin Découpage designing paper weights, shoes, bags and aprons. She enjoyed the session so much that she volunteered another session teaching the ladies how to create crepe paper roses and carnations. Ms Janice Chow (extreme right) from Trinkets Et Cetera * Handmade Accessories & Gifts * taught the clients how to make Button earrings, Button pendants and Button badge reel. Ms Priyanka Gupta (extreme right) from JustLoveCrafts who taught the clients a handicraft skill - Paper craft (Quilling) and the designs used can be on photo frame and greeting cards. About Ms Priyanka Gupta: A professional paper quiller. Having practicing this craft for almost 5 years now, quilling has become more than just a hobby. Even though she holds a Master's degree in Investment and Finance from University of London, her love for crafting gradually developed into a passion and ultimately a suitable career choice. Now, Ms Priyanka makes functional products with quilling and exhibits them at various places where those products are being sold. Her products include greeting cards, photo frames, jewellery, candle holders, wall décor etc entirely handcrafted with the delicate art of paper quilling. She also conducts workshops for individuals, corporates and craft centres and loves to share her quilling knowledge with people at large. Ms Elyse-Anne (middle) from Elyse Anne: PurposelyInLove.com taught the ladies jewelry making. Elyse is Singapore and Asia's Leading LOVE and Relationship Sucess coach for women from Elyse Anne: PurposelyInLove.com. Elyse was featured as a LOVE expert in CLEO magazine (February 2013 issue), invited as a guest speaker on radio 938 LIVE (Eugene Loh's A slice of Life and Michelle Martin's Wow Club), an expert on the website, SelfGrowth.com, LifeStyleAsia.com, featured writer in Digital Romance and Xtraordinary Women - Best Working Mum Award 2013.